Aberrant hyperactivation of epithelial proliferation, AKT signaling, and association with unopposed estrogen (E2) exposure is the most common endometrial cancer dysfunction. In the normal uterus, progesterone (P4) inhibits proliferation by coordinating stromal-epithelial cross-talk, which we previously showed is mediated by the function of Mitogen-inducible gene 6 (Mig-6). Despite their attractive characteristics, non-surgical conservative therapies based on progesterone alone have not been universally successful. One barrier to this success has been the lack of understanding of the P4 effect on endometrial cells. To further understand the role of Mig-6 and P4 in controlling uterine proliferation, we developed a Sprr2f-cre driven mouse model where Mig-6 is specifically ablated only in the epithelial cells of the uterus (Sprr2f cre+ Mig-6 f/f ). We examined P4 effect and regulation of AKT signaling in the endometrium of mutant mice. Sprr2f cre+ Mig-6 f/f mice developed endometrial hyperplasia. P4 treatment abated the development of endometrial hyperplasia and restored morphological and histological characteristics of the uterus. P4 treatment reduced cell proliferation which was accompanied by decreased AKT signaling and the restoration of stromal PGR and ESR1 expression. Furthermore, our in vitro studies revealed an inhibitory effect of MIG-6 on AKT phosphorylation as well as MIG-6 and AKT protein interactions. These data suggest that endometrial epithelial cell proliferation is regulated by P4 mediated Mig-6 inhibition of AKT phosphorylation, uncovering new mechanisms of P4 action. This information may help guide more effective non-surgical interventions in the future. Endometrial cancer is the most common gynecologic malignancy in the United States, and in the last several decades the incidence of new cases each year has increased . Endometrioid endometrial cancer, the most common type of endometrial cancer (80–85%), is associated with or preceded by abnormal multiplication of endometrial epithelial cells, known as complex atypical hyperplasia [2–4]. The main treatment for endometrial cancer is hysterectomy [5, 6]. Although most endometrial cancer diagnoses are in post-menopausal women, 5% of cases are diagnosed before age 40 and 20~ 25% before menopause . Moreover, the incidence of endometrial cancer diagnoses in younger patients is likely to increase going forward due to increases in obesity, hypertension, diabetes mellitus, and other known endometrial cancer risk factors [8–10]. Therefore, the demand for non-surgical approaches to endometrial cancer is increasing, especially for women of reproductive age with complex atypical hyperplasia and early-stage endometrioid endometrial cancer who wish to preserve their fertility beyond treatment [8, 10]. Although hysterectomy is a key therapy for endometrial cancer [5, 6], recent intrauterine progestin therapies such as a levonorgestrel-releasing intrauterine system have been used for reproductive-aged women with complex atypical hyperplasia and early-stage endometrial cancer in cases when there is a desire to preserve fertility or when comorbidities exclude the possibility of surgery. In addition, progestin therapy is also considered for recurrent endometrial cancer because it is less toxic than chemotherapies; however, though the response rate of endometrial hyperplasia to progestin treatment is higher than that of endometrial adenocarcinoma, the response to progestin in cancer recurrence is worst of all. Progestin therapies used in the clinic are effective for some patients but not all cases of endometrial hyperplasia and well-differentiated endometrioid endometrial cancer. Another major limitation of progestin therapy is the lack of a clinical standard protocol for the type, dose, and duration of treatment [11–13]. The molecular mechanisms underlying progesterone (P4) resistance in endometrial cancer have not been fully understood. Loss of control over uterine epithelial cell proliferation and apoptosis by ovarian steroid hormones is the major underlying pathogenesis of endometrial cancer [14–17]. Progesterone therapy can prevent this process by blocking actions of unopposed estrogen (E2) . Nonetheless, several studies indicate that P4 therapy has low and unpredictable response rates in women with endometrial cancer, therefore limiting its potential use [19–23]. Resistance to P4 treatment due to loss of either progesterone receptor (PGR) itself or its signaling pathways causes significant difficulty in the treatment of advanced and recurrent endometrial cancer . Identifying molecular mechanisms involved in P4 resistance is critical to effective and personalized treatment. Unfortunately, further translational research of endometrial cancer is inhibited by the lack of sufficient pre-clinical animal models. Sequencing analysis of endometrial cancers in the Cancer Genome Atlas has revealed that upwards of 90% of cases of endometrioid endometrial cancer have some genetic aberration in the PTEN/PI3K pathway, which results in increased AKT activity . In addition, the AKT signaling pathway can be activated by E2  enhancing cell proliferation . Therefore, an understanding of the molecular mechanisms between steroid hormone and PTEN/PI3K/AKT signaling will allow us to be in a much better position to develop new conservative therapies based on P4 function. The protein structure of AKT consists of a PH domain, a linker region, a kinase domain, and a regulator domain . These domains undergo various protein modifications including phosphorylation, acetylation, ubiquitylation, methylation, hydroxylation, glycosylation, and SUMOylation which help regulate the proteins activity . AKT regulates different pathways that aid in the promotion of cellular survival and inhibition of apoptosis through its serine/threonine kinase activity [30, 31]. Inappropriately elevated expression of AKT phosphorylation is related to poor prognosis of endometrial cancer patients . Furthermore, inhibition of the AKT pathway combined with P4 decreases angiogenesis and proliferation in vivo, indicating that regulation of the AKT pathway may play an important therapeutic role . Mitogen-inducible gene 6 (MIG-6) functions to suppress endometrial cancer in the human and mouse uterus [34, 35]. Mig-6 is an important mediator of P4 signaling in that it inhibits E2-mediated epithelial proliferation in the uterus [35, 36]. MIG-6 loss is uniquely associated with infertility and endometrial cancer [35, 37–39], but the effects of MIG-6 loss have not been specifically investigated in regulation of epithelial proliferation of endometrial cancer. In this study, we demonstrate that Mig-6 is pivotal in the suppression of epithelial proliferation through its inhibition of AKT activation. Specifically, we show that P4 inhibition of endometrial tumorigenesis is mediated by MIG-6 inhibition of AKT phosphorylation. Mice were maintained for and used in the designated animal care facility according to the Michigan State University institutional guidelines. All animal procedures were approved by the Institutional Animal Care and Use Committee of Michigan State University. Mice were housed in standard cages (up to 5 animals per cage) in rooms with 12 h light/dark cycle, controlled temperature and humidity under specific pathogen-free conditions. Campus Animal Resources at Michigan State University provides veterinary care, daily husbandry and health checks, procurement, and other administrative support for research in biomedical housing facilities and assists with animal health. Animals are observed daily by animal care staff that have additional training in laboratory animal sciences and species-specific handling and husbandry. To generate uterine epithelial specific Mig-6 knockout mice, Mig-6 f/f mice were crossed with Sprr2f cre/+ mice . Control (Mig-6 f/f ) and endometrial epithelial cell-specific Mig-6 knockout mice (Sprr2f cre/+ Mig-6 f/f ; Mig-6 d/d )  were used to investigate the effect of epithelial Mig-6 ablation on the uterus. Vehicle (beeswax) or P4 (40 mg/pellet) pellets were placed subcutaneously into control (Mig-6 f/f ) and Sprr2f cre+ Mig-6 f/f mice respectively at 10 weeks of age for 1 week (n = 6/treatment/genotype). To avoid any possibility of pain and/or distress to the animal, all surgical procedures were performed under anesthesia. Mice were anesthetized with isoflurane (3% isoflurane in oxygen by inhalation). All surgeries were conducted in dedicated surgical suites using aseptic procedures. Recuperating animals, under close supervision, were kept warm until full postoperative recovery is achieved. Animals were under anesthetic for a maximum of 20 min, and recovery from surgery normally occurs within 30 min as evidence by sternal recumbency, followed by normal ambulation, grooming and feeding. If discomfort is observed, the animals were provided Ketoprofen at a dose of 5 mg/kg as an analgesic. At the end of a given study, all mice were humanely euthanized by cervical dislocation under isoflurane anesthesia or by carbon dioxide asphyxiation and then the uteri from control and Sprr2f cre+ Mig-6 f/f mice were collected to investigate the effect of P4 on the development of endometrial hyperplasia. Immunohistochemistry analysis was performed as previously described . Briefly, uterine sections were pre-incubated with 10% normal goat serum in PBS prior to exposure to anti-PGR (SC-538; Santa Cruz Biotechnology, Dallas, TX), anti-ESR1 (SC-543; Santa Cruz Biotechnology, Dallas, TX), anti-AKT (CS-4691; Cell Signaling, Danvers, MA), anti-pAKT (CS-4060; Cell Signaling, Danvers, MA), and anti-Ki67 (BD5506090; BD Biosciences, San Jose, CA) as appropriate primary antibodies. Positive signaling was detected with the DAB Peroxidase Substrate Kit (SK-4100; Vector Laboratories, Burlingame, CA). The H-score was calculated as previously reported . The overall H-score ranged from 0 to 300. Ishikawa (99,040,201; Sigma–Aldrich, St. Louis, MO) and HEC1A (HTB-112; ATCC, Manassas, VA) Cell lines are maintained in Dulbecco’s modified Eagle’s medium/Nutrient Mixture F-12 (DMEM/F12; Gibco BRL, Gaithersburg, MD) with 10% (v/v) fetal bovine serum (FBS; Gibco BRL, Gaithersburg, MD), and 1% (v/v) penicillin streptomycin (P/S; Gibco BRL, Gaithersburg, MD) at 37 °C under 5% CO2. FLAG-tagging MIG-6 expression vectors were transfected using Lipofectamine 2000 reagent (Invitrogen Crop., Carlsbad, CA) according to the manufacturer’s instructions. Immunoprecipitation was performed as described previously . Briefly, Ishikawa and HEC1A cells were transfected with the FLAG-MIG-6 expression vectors. Immunoprecipitation was performed with Flag antibody (F1804; Sigma–Aldrich, St. Louis, MO). Protein interactions were examined by Western blot analysis. Western blot analysis was performed as previously described . Membrane was blocked with Casein (0.5% v/v) prior to exposure to anti-AKT (CS-4691; Cell Signaling, Danvers, MA), anti-pAKT (CS-4060; Cell Signaling, Danvers, MA), and anti-Flag (F1804; Sigma-Aldrich, St. Louis, MO) antibodies. Anti-actin (SC-1615, Santa Cruz Biotechnology, Dallas, TX) was used for loading control. For data with only two groups, Student’s t-test was used. For data containing more than two groups, an analysis of variance (ANOVA) test was used, followed by Tukey or Bonferroni test for pairwise t-tests. All statistical analyses were performed using the Instat package from GraphPad (San Diego, CA, USA). 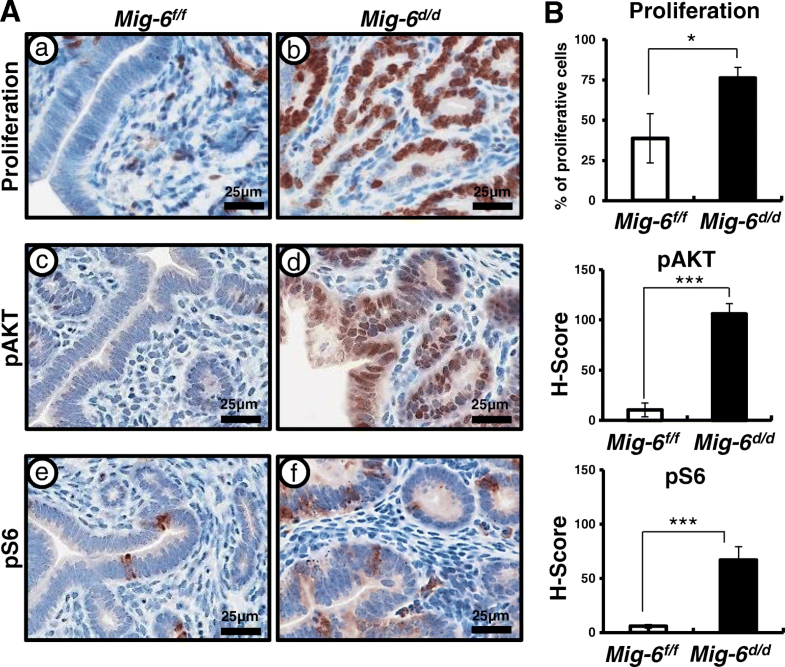 Previously, we reported that the hyperplastic phenotype of endometrial epithelial cell specific Mig-6 knockout (Sprr2f cre+ Mig-6 f/f ; Mig-6 d/d ) mice were observed at 10 weeks of age . Endometrial cancer displays an imbalance in steroid hormone action [14–17]. PGR expression has been shown to be a prognostic factor for endometrial cancer [44–46]. Therefore, we first examined expression of PGR and ESR1 in Mig-6 d/d mice. Immunohistochemical analysis indicated that levels of PGR and ESR1 were significantly decreased in the stromal cells of Mig-6 d/d mice compared to control (Mig-6 f/f ) mice at 10 weeks of age (n = 6/genotype). However, the expression of PGR and ESR1 in the epithelium were not changed in the uteri of Mig-6 d/d mice as compared to control (Fig. 1). These data suggest that dysregulation of PGR and ESR1 expression in the stroma may play an important role for the development of endometrial hyperplasia. AKT is frequently hyperactivated in human cancers . To determine if the observed hyperplastic phenotype was due to activated AKT signaling, we examined the expression of total AKT, phospho-AKT (pAKT), and phospho-S6 (pS6), a downstream marker of active AKT signaling in the uteri of control and Mig-6 d/d mice. First, we examined cell proliferation by Ki67 staining (n = 6/genotype). The IHC results revealed a significant increase of uterine epithelial proliferation in Mig-6 d/d mice (Fig. 2a-b). Interestingly, we found that pAKT and pS6 were highly elevated in the epithelial cells of Mig-6 d/d mice at 10 weeks of age as compared to control mice (Fig. 2). However, total AKT levels were not changed among the genotypes (Additional file 1: Figure S1). These data suggest that MIG-6 suppresses endometrial epithelial proliferation via inhibition of AKT phosphorylation. Exposure to P4 is a negative risk factor for endometrial cancer . Additionally, it is well known that endometrial cancer is E2-dependent and that progestin therapy has been successful in slowing the growth of endometrial tumors in women who are poor surgical candidates and premenopausal women with complex atypical hyperplasia and early-stage endometrioid endometrial cancer who had a strong desire to preserve their fertility [22, 23, 49–54]. To assess the effect of P4 treatment on epithelial ablation of Mig-6, we placed P4 or vehicle pellets into the control and Mig-6 d/d mice subcutaneously at 10 weeks of age (n = 6/treatment/genotype). 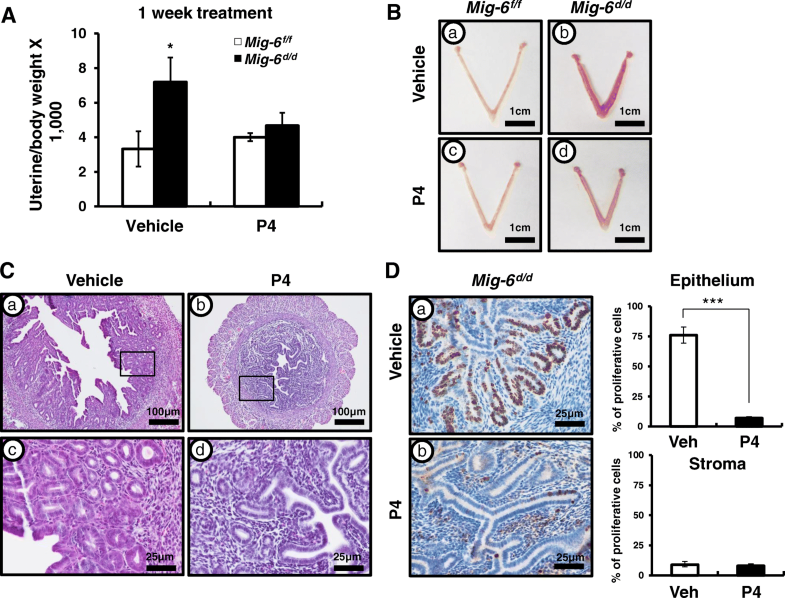 After 1 week of the P4 treatment, Mig-6 d/d mice exhibited a significantly decreased uterine weight compared to vehicle-treated Mig-6 d/d mice (Fig. 3a and b). Histological analysis showed that the development of uterine hyperplasia was not evident in Mig-6 d/d mice after P4 treatment (Fig. 3c). P4 treatment also led to decreased proliferation in the epithelial cells of Mig-6 d/d mice as compared to vehicle-treated Mig-6 d/d mice (Fig. 3d). These data suggest that the hyperplastic phenotype of Mig-6 d/d mice was responsive to P4 treatment, returning the morphology to normal. The expression of PGR and ESR1 is strongly correlated with the prognosis of endometrial cancer . Therefore, we examined the expression of PGR and ESR1 using immunohistochemistry (n = 6/treatment). The expression of PGR and ESR1 were significantly increased in the stroma of Mig-6 d/d mice after P4 treatment (Fig. 4). These data indicated that P4 treatment activates nuclear receptors signaling at endometrial stromal cells of Mig-6 d/d mice. Next, we examined the expression of total AKT, pAKT, and pS6 using immunohistochemistry in the uteri of control and Mig-6 d/d mice after P4 treatment to investigate whether the suppression of hyperplastic phenotype observed was due to recovered AKT signaling. Total AKT levels were not changed after P4 treatment (Additional file 2: Figure S2). However, aberrant activation of AKT signaling was significantly decreased in the uteri of P4-treated Mig-6 d/d mice as compared to vehicle-treated Mig-6 d/d mice (Fig. 5). These data suggest that P4 treatment suppresses aberrant activation of AKT signaling in endometrial hyperplasia of Mig-6 d/d mice. In order to examine effects of MIG-6 on AKT, we performed experiments on endometrial cancer cell lines, Ishikawa and HEC1A cells. We transfected to Ishikawa and HEC1A cells dose-dependently with FLAG-tagged MIG-6 (FLAG-MIG-6). Following MIG-6 introduction we examined levels of AKT and pAKT at 24-h. The levels of AKT phosphorylation were highly decreased by FLAG-MIG-6 in a dose dependent manner whereas AKT levels were unchanged (Fig. 6a). We next examined whether MIG-6 physically interacts with AKT. Ishikawa cells were transfected with FLAG-MIG-6, and the lysates were immunoprecipitated with FLAG antibody. FLAG immunoprecipitates were then probed with AKT and MIG-6 specific antibodies, indicating that MIG-6 physically interacts with AKT (Fig. 6b). These results suggest that MIG-6 inhibits AKT phosphorylation through a protein-protein interaction, highlighting its important role in the regulation of epithelial proliferation. In this study, we evaluated whether MIG-6 suppresses endometrial epithelial proliferation via inhibition of AKT phosphorylation. P4 plays an inhibitory role on E2 stimulated proliferation of uterine epithelial cells . Disruption of steroidal control results in unopposed E2, leading to endometrial cancer . Mig-6 is a target of P4 and PGR, and its deletion in the uterus leads to enhanced epithelial proliferation . The majority of endometrial cancers exhibit actively proliferating epithelial cells and increased AKT signaling [57–59]. The Cancer Genome Atlas analysis demonstrated an increased AKT activity in endometrioid endometrial tumors . Activated AKT signaling enhances cell proliferation as well as cell survival through the inhibition of proapoptotic proteins . Expression of PGR (PR-A and PR-B) and ESRs (ESR1 and ESR2) has been reported as prognostic factors for endometrial carcinoma [44–46]. We evaluated that stromal PGR and ESR1 expression was significantly decreased in the uteri of Mig-6 d/d when compared to control mice (Fig. 1). We showed elevated phosphorylation of AKT resulting in enhanced epithelial proliferation (Fig. 2). Stromal PGR and P4 signaling is necessary and sufficient to mediate the antiproliferative effects of P4 on E2-induced epithelial cell proliferation [60, 61]. However, activation of AKT reduces PR-B transcriptional activity in Ishikawa cells and Pten d/d conditional mouse model of endometrioid endometrial cancer . AKT also reduces PGR expression levels in breast cancer cells, endometrial cancer cells, and uterine stromal cells affected by endometriosis [62–64]. However, exactly how signaling occurs between AKT and P4 resistance in endometrial epithelial and stromal interaction is unclear. Filling this knowledge gap is critical to understanding P4 resistance. P4 resistance is defined by the decreased responsiveness to bioavailable P4 of target tissue . Lack of P4 activity contributes significantly to uterine pathophysiology. P4 resistance is now considered a central element in women’s diseases such as infertility, endometriosis, and endometrial cancer [66–69], but the mechanism of P4 resistance in women’s diseases remains unknown. We have demonstrated that Mig-6 d/d mice exhibiting normal P4 responses and P4 treatment for 1 week is sufficient to restore endometrial hyperplasia to normal (Fig. 3). We treated the mice in the beginning of endometrial hyperplasia and the data suggest P4 treatment at an early time point can be one of the reasons to reverse endometrial hyperplasia to normal. Therefore, further study on the effects of P4 treatment on endometrial turmorigenesis associated with its development and progression are required. Determining the molecular mechanisms by which steroid hormones control the physiology of the uterus is of utmost importance to understanding and overcoming P4 resistance. However, resistance to P4 treatment has led to limiting the use of P4 therapy in endometrial cancer due to its low response rates [19–23]. The optimal method for treating and surveilling patients with conservatively treated endometrial cancer is not known. Therefore, the identification of the molecular pathways that link P4 resistance to endometrial cancer development can potentially provide novel targets for the prevention or treatment of this malignancy. We showed that AKT signaling is down-regulated after P4 treatment in Mig-6 d/d mice (Fig. 5). These data suggest that treatment with an AKT inhibitor could be a viable alternative for overcoming the P4-resistant endometrial hyperplasia and cancer. We found that MIG-6 decreased AKT phosphorylation in Ishikawa and HEC1A cell lines in a dose-dependent manner. 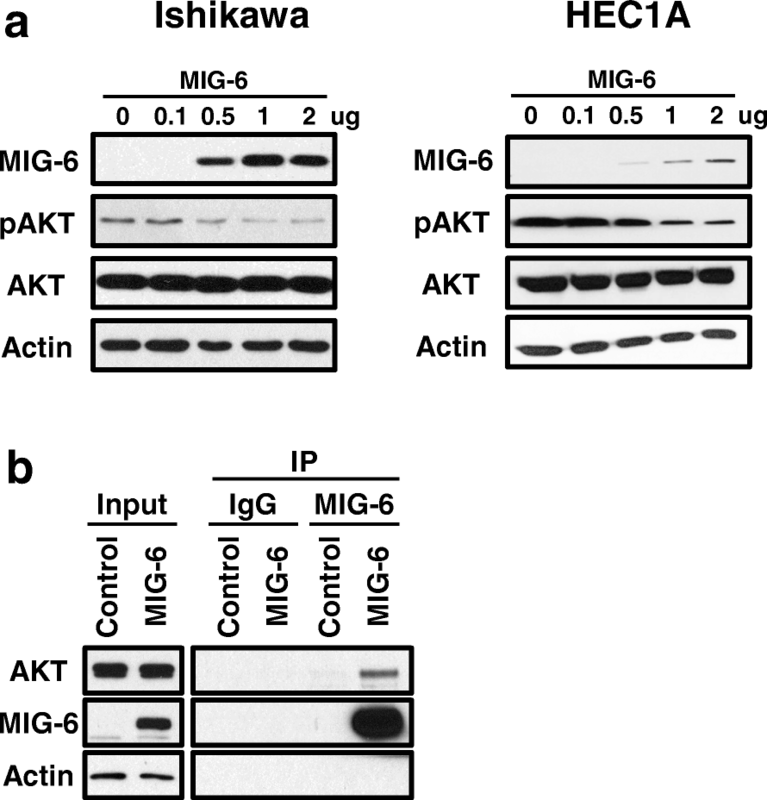 Immunoprecipitation showed that there is protein interaction between MIG-6 and AKT, suggesting that MIG-6 suppresses E2-induced epithelial cell proliferation through AKT interactions (Fig. 6). However, the exact molecular mechanism by which interaction regulates the phosphorylation of AKT is not clear. Further studies will be required to determine exact molecular mechanism. We have shown the prevention effect of P4 with Mig-6 d/d mice . We treated Mig-6 d/d mice with P4 before developing endometrial hyperplasia and found that P4 prevented the development of endometrial hyperplasia by inhibiting epithelial STAT3 phosphorylation, resulting in a decrease of epithelial proliferation. The molecular mechanisms in the regulation of epithelial proliferation by AKT and STAT3 as well as steroid hormone signaling remains to be further studied during endometrial tumorigenesis. Our data support that the activation of stromal signaling by P4 treatment can contribute to the development of endometrial hyperplasia and the cross-talk between AKT/STAT3 and PGR/ESR1 is critical to inhibit the endometrial hyperplasia. Overall, our study suggests that the negative regulation of AKT phosphorylation by activated stroma signaling including Mig-6 has an important role in the regulation of epithelial cell proliferation during endometrial hyperplasia development and progression. Our results contribute to the understanding of the etiological and molecular mechanisms of epithelial cell proliferation and to the development of new therapeutic approaches for treating endometrial hyperplasia and cancer. Jung-Yoon Yoo and Hee-Bum Kang contributed equally to this work. The Sprr2f-cre mice were acquired from Dr. Diego H. Castrillon (University of Texas Southwestern Medical Center, Dallas, TX). We would like to thank Ryan M. Marquardt for manuscript preparation. Grant numbers and sources of support: The design, data collection, data analysis, and data interpretation of this study was supported by Grant Number P50CA098258 from the National Cancer Institute (to R. R. Broaddus and T.H. Kim). The analysis and interpretation of in vitro experiments and writing support of this manuscript were supported by the National Research Foundation of Korea (NRF) grant funded by the Ministry of Education, Science and Technology (No. NRF-2016R1D1A1B03934346, to J.Y. Yoo), and NRF grant (No. NRF-2017R1A2B4007971, K.-C. Choi). JYY, and HBK conceived and designed the experimental approach, performed experiments and prepared the manuscript. JIR analyzed the results. RRB provided pathological analysis. KCC and THK conceived and designed the experimental approach, performed data analysis and prepared the manuscript. All authors have read and approved the final version of manuscript. All animal procedures were approved by the Institutional Animal Care and Use Committee of Michigan State University (Application #: 11/16–192-00).